The jewelry cabinet is beginning to look more like an actual piece furniture, or maybe that is just in my head, after all it is not even glued up yet. After flattening all the panels I thought it would be a good time to finish applying the koa applied edges, first on the back, then sides and lastly the front. Done in this order so the only end grain visible is from the forward facing sides. Before applying the edges I smoothed and squared each surface. On the front of the cabinet there will be subtle convex curve, so before applying the edge on the front I mocked up a curve out of poplar and traced it on to the cabinets top and bottom. From there it was over to the bandsaw to rough out the curve. Below you can see the curve after it was fared and smoothed with a small block plane. After all the applied edges were complete I moved on to beginning the coopered door process. Using the same template for the convex front, I laid out the individual staves the will make up the core of the doors. 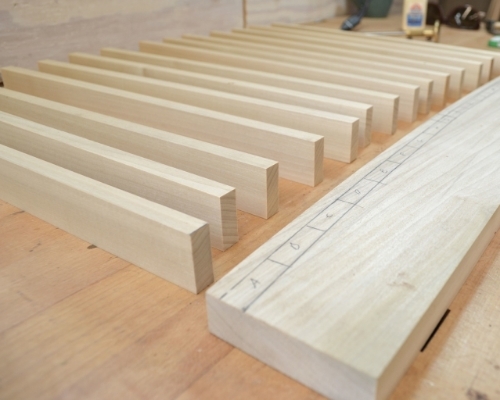 Each stave will get a bevel and then matched to the bevel marked on the template and glued one at a time. After all the staves have been glued they can begin to be coopered and readied to apply the first layer of cross-banding (1/16 poplar). Below you can see the shaping. This process just involves planing then setting the door onto the template to check the progress. When the shaping is complete, into the vacuum press they go to get their 1/16 poplar cross-banding. Here you can see a good look at each individual stave and the 1/16 cross-branding after they have come out of the press and received a little clean up. While the doors were in the vacuum press I moved on to arranging the koa I had previously re-sawn for the doors. From side to side the cabinet is roughly 22″. I had three, 8″ resawn pieces of koa that could have easily been jointed to make the span, but doing it this way would give and interrupted look in the grain. If you have seen commercial vertical grain plywood then you know what I am talking about. By taking a few extra cuts you can rearrange the grain pattern to give it the look of one large tree section, one uninterrupted grain pattern.